Once you have defined an operational excellence strategy within your organization, the next step is to get the executive committee on board with the decision. 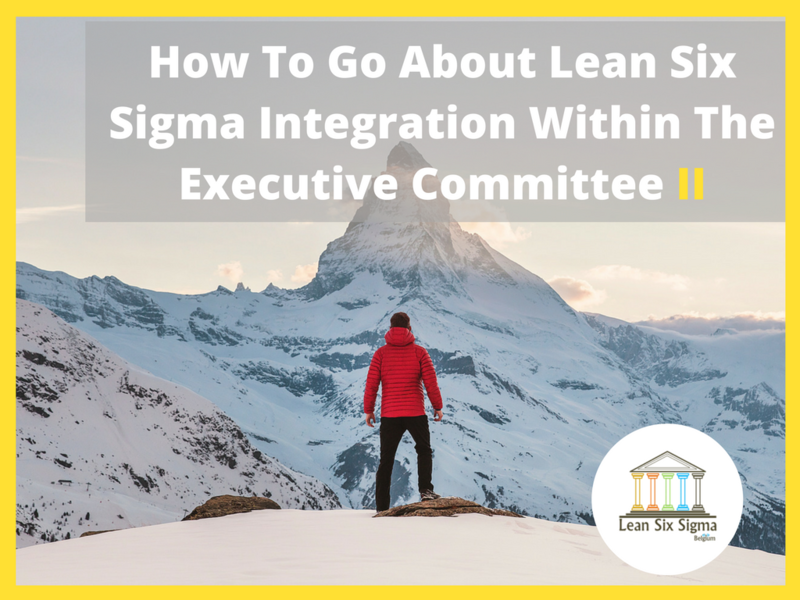 The executive committee is responsible for running an organization and you cannot move forward with the Lean Six Sigma integration without their sponsorship. Therefore, it is essential that you satisfy all the queries and concerns that the executive sponsors might have regarding Lean Six Sigma. So, how can you convince the executive committee to integrate the Lean Six Sigma culture in their organization? To ensure that the executive sponsors have a better understanding about Lean Six Sigma, you should start off by providing them with content that they can easily read and understand. This does not mean that you should hand out a 100-page book that contains raw information about Lean Six Sigma statistics and DMAIC tools to the executive sponsors, though. There are a number of good books, workshops or training on Lean Six Sigma which is geared towards the executive audience and can be easily read and understood in a few hours. These type of content cover everything from the basics of Lean Six Sigma and DMAIC to the actual role of an executive sponsor. We generally use serious or business games to show them the power of the methodology. At the end of this practice, it is best practice to conduct a test with the executive sponsors for determining how much they know about Lean Six Sigma. This information is valuable since the Lean Six Sigma deployment leaders need to be aware of how involved the executive sponsors are with the program. The best scenario is to have one Black Belt in the executive committee. It is essential that executive sponsors understand the role that they play in Lean Six Sigma integration. The executive committee is responsible for generating the vision for the initiative of Lean Six Sigma. This vision is what is used for establishing the strategic goals and business targets that have to be achieved by the Lean Six Sigma program. Ultimately, these executive sponsors are the ones that will promote the use of Lean Six Sigma methods and tools within the organization by providing a suitable environment. This is the role that these executive sponsors play in Lean Six Sigma integration. The best way for helping the executives understand their role is to have them participate in a workshop (one day or two days) for informing them about the Lean Six Sigma strategy and how it can be useful to deploy an operational excellence strategy. An overview of Lean Six Sigma, DMAIC, and the deployment plan should be included in the workshop. There should also be discussions about the deliverables and the concerns of the Lean Six Sigma strategy so that the executives are aware of how things will pan out to be. For this purpose, you can make use of presentations with statistics, graphs, and animations that will make it easier (and quicker) for the executives to understand Lean Six Sigma roles. 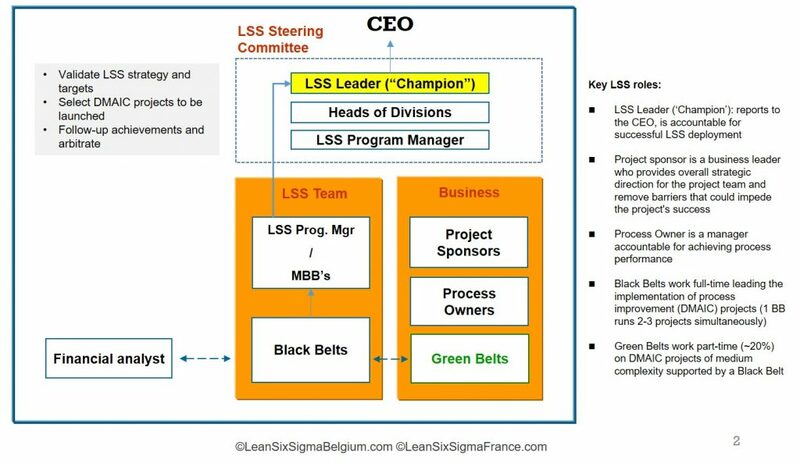 Within the presentation, you should highlight the role of Black Belts, Green Belts, Head of Divisions, and the Program Manager along with training facilities that are available to give them an idea of how the changeover to Lean Six Sigma will occur. It can be difficult to convince the executive committee to completely overhaul the business strategy for implementing Lean Six Sigma. However, if you tell them exactly why does their organization need Lean Six Sigma then it will help change their mind. The utmost priority of Lean Six Sigma is to take up a customer-centric approach. It makes the customer experience a vital component within the target environment. The methodologies of Lean Six Sigma require that the management has knowledge about the customer’s desires based on careful assessment and real data rather than assumptions, corporate myths, and conjectures. With Lean Six Sigma, the business processes between entities are designed in such a manner that they seek to fulfil customer requirements and enhance customer service. The integration of a Lean Six Sigma strategy in an organization ensures a multifaceted, continuous “voice of the customer” effort that makes use of customer data for enhancing the customer experience and drastically improving customer satisfaction. Integrating a Lean Six Sigma strategy within an organization increases the efficiency on business tasks and processes. Organizations that have successfully implemented Lean Six Sigma has been able to achieve notable increases in efficiencies with both small and large processes. Black Belts are specifically trained to analyze each process for weaknesses that can be eliminated to achieve maximum efficiency in terms of resources and time. In Lean Six Sigma terminology, an organization is thought to be a sum of processes and parts, and the goal of any Lean Six Sigma strategy is to ensure that each process and part is working at its fullest potential. The ultimate goal of revamping a business strategy is to lower waste and increase value creation which is exactly what Lean Six Sigma does. By removing waste (in terms of resources, defects, motion, time…) and solving the problems that are faced by business processes, Lean Six Sigma reduces the costs of these processes and hence, increases the revenue generated. For instance, without Lean Six Sigma, if an employee is idle for a certain time period in an organization then this is considered to be a ‘waste’ since that you are still paying the employee for that duration. A Lean Six Sigma strategy allows you to streamline the processes within a business in such a manner that there are no wasted resources. Once an organization has established itself in a local environment, the next step that it looks forward to is global expansion. Drawing up a global strategy and implementing it is a primary concern of the executive committee which can be assisted through the integration of a Lean Six Sigma strategy. The main challenges that are faced by a business with their global strategy are lack of stability and increased costs. Highlight the benefits of Lean Six Sigma to the executives and help them understand how this approach can help them reduce waste, improve efficiency, lower costs, and lead to long-term stability for the organization. Show them that Lean Six Sigma goes hand-in-hand with the global strategy since it encourages steady growth within the organization in terms of resources and profits. Stability and efficiency within an organization are the fundamentals of global expansion and these are exactly what a Lean Six Sigma strategy can help an organization achieve. For successful integration, it is necessary that you develop a holistic plan for communication around the Lean Six Sigma strategy. Your aim should be to design a communication plan that makes use of the strength of the executives i.e. communication skills. You should look towards incorporating executives in such a way that they are key elements of the communication plan. This is important because it keeps the executives involved with the Lean Six Sigma strategy and utilizes their communication skills and authority for spreading awareness about the program. Write up a brief yet compelling description of what Lean Six Sigma and its integration means to the organization – something like an ‘elevator speech’ – and then provide this description to the executives. This speech-styled description can be used by executives when they talk about Lean Six Sigma with an executive or an associate of another organization. The entire purpose of convincing the executives about Lean Six Sigma is to earn their sponsorship because that is what will get you moving forward. You are not looking for an actual commitment and not just word of mouth. What this means is that you want the executive sponsors to actually be with you and support you with the Lean Six Sigma integration, not just say go through the motions and be part of the communication plan. Therefore, once an executive sponsor is on board, the next thing that you need to do is to document the commitment so that you can take the next step forward with complete assurance of their support. Represent the commitments of each executive sponsor on a curve that represents their knowledge of the Lean Six Sigma strategy and their commitment to the program. This is important since it helps you understand how you can cooperate with each individual sponsor. The executive committee is responsible for running an organization. To move ahead with the Lean Six Sigma integration, you need the approval and sponsorship of this committee. You should convince the executive sponsors by creating awareness about Lean Six Sigma (through reading materials and presentations), helping them understand their roles in Lean Six Sigma, telling them about the benefits of Lean Six Sigma, and showing them that it can be aligned with a global strategy. Keep the executives involved with the plan by involving them in communications and helping them highlight the importance of Lean Six Sigma for the organization. Once the executives are on board with the sponsorship, document their commitment so that you can move forward to selecting the right DMAIC projects for the transformation project.